We encourage theater students to study abroad during their junior or senior year or during the summer. This is an opportunity for students to explore another culture while continuing their theater training. Not every study-abroad program is approved by Skidmore, nor will Skidmore or the department necessarily accept all transfer credit. Study abroad programs require students to have a minimum GPA of 2.75. Some programs may require auditions. Students interested in these programs or any others should speak to an appropriate faculty member early during the sophomore year. Additional sources of information include the Office of Off-Campus Study & Exchanges and the brochures and other literature that is posted in the second floor hallway of the theater. But the best sources of information on any of these programs are the juniors and seniors who have recently participated in them. The London Theatre Program, British American Dramatic Academy (BADA) offers a theater training program in London, England. Students take an array of acting courses and participate in semester-end productions led by professional directors from the London stage. The National Theater Institute offers a semester-long program at the Eugene O’Neill Theater Center in Waterford, Connecticut, in both the fall and spring semesters. In this accredited program, students work together on a series of courses and projects in acting, directing, design, movement, voice, and playwriting under the guidance of a professional faculty. The O’Neill Moscow Art Theatre Semester is an international program offered by NTI every fall at the Moscow Art Studio Theatre in Russia. 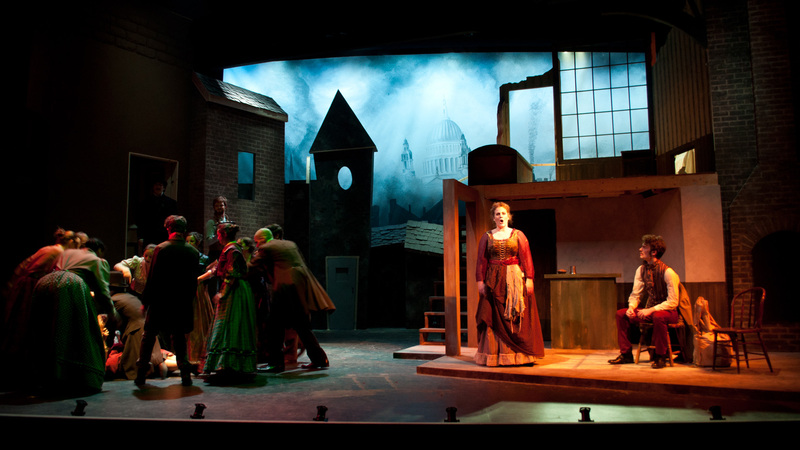 The Gaiety School of Acting in Dublin, Ireland, offers 15-credit set curriculum through IES that gives theater students practical performance experience in an Irish context in both the fall and spring semesters. All courses are taught by GSA faculty; courses are partially integrated with both local and IES students. Field study includes visits to Dublin theater performances and a three-day field trip to the historic theater district in London’s West End; students share costs with IES. Midsummer at Oxford is a four-week intensive conservatory training course offered by BADA every summer at Balliol College, Oxford University, England. SITI (Saratoga International Theatre Institute) is a four-week intensive conservatory training course offered every summer at Skidmore College. Students from world over study View Points and Suzuki Training with members of Anne Bogart’s company. The Accademia dell’Arte is dedicated to training, researching, and experimenting to realize individual goals and collaborative projects. The location of the school in Arezzo enables students to come into close contact with professional actors, directors, musicians, technicians, and numerous artists who make up the world of European theater and performance. Students experience a rigorous education that takes place in an atmosphere that encourages individual expression and experimentation. Study at the Accademia combines an intensive Italian language program and academic studies with a semester of high-level theater, music, and dance performance training, combining rigorous technical training with the aim of achieving an overall synergy of skills that will help to develop students both professionally and personally. Spring Comprehensive Program, mid-May through the end of June. This is an opportunity for students to achieve a foundation in the Practical Aesthetics technique outlined in A Practical Handbook for the Actor. Classes include “Script Analysis,” “Performance Technique,” “Repetition,” and voice and/or movement. The classes are open to beginning and professional acting students and to NYU students for credit. The program begins toward the end of May and runs for six weeks. Classes are held Monday through Friday, 1–6 p.m. The cost of the program is $1,800. Check our admission procedures if you are interested in applying. Summer Intensive Program, end of June through the beginning of August. The Atlantic Acting School offers an intensive six-week workshop each summer from July to mid-August in New York City. By the end of the Summer Intensive Program, students have a strong foundation in the Practical Aesthetics technique outlined in A Practical Handbook for the Actor. Through intensive scene study and a variety of specific exercises, students will learn the script analysis process and the moment-to-moment work covered in the book. Equal emphasis is placed upon the voice, speech, and movement training. Classes are held Monday through Saturday from 9 a.m. to 6 p.m. Guest Lectures are held every Saturday with visiting professionals. Everyone is required to take all the classes. The tuition for the Summer Intensive Program is $2,500. We are unable to provide housing for the students. Due the intensity of the program and the workload required, we advise that students avoid any outside work during the six weeks. The Summer Intensive Program is open to beginning and professional acting students and the NYU students wishing to obtain college credit. An interview is required for admission to the Summer Intensive Program. Space is limited. If you are interested in applying to the program, please see our admissions procedures. University of the Arts London program enables American students to study full-time for either one or two semesters in a number of British schools. Of particular interest are the programs at Central Saint Martins, one of the very best professional schools for actors, directors, and designers, and Wimbledon College of Art, one of London’s best schools for theater design. As with most UK colleges, these schools offer three 10-week terms. We are currently trying to reconcile this with Skidmore’s system. Read more information about study abroad opportunities in the Theater Handbook.